If you're a regular reader of Digitology you'll know that I love Thai food, and in particular I love Saba here in Dublin. 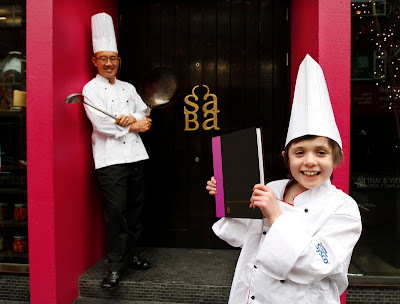 So you can imagine how incredibly delighted I was to hear that Saba have just launched a cook book, The Saba Cookbook. To tell you the truth, this isn't a new idea and has very much been on the cards for Tweesak Trakoolwattana (known as Tao), Saba Executive Chef, and Saba’s owner Paul Cadden for some time. The two have always wanted to create a cook book that would showcase their restaurant's authentic Thai food. What makes this a particularly noteworthy endeavour, beyond the absolute deliciousness of the offerings therein, is that all proceeds are to be split between an Irish charity, Our Lady’s Hospital for sick children in Crumlin, and a Thai charity, the Thai Red Cross (who help with the recent floods in Tao’s hometown, Bangkok). The book will offer us budding Thai cooks nearly different authentic 100 recipes and will cover everything from Tao's tasty Thai soups and salads to his now famous curries and stir fries. You'll also find some desserts in there to create the perfect, complete Thai meal. I definitely recommend this as the perfect gift this Christmas for anyone you know who loves Thai food!